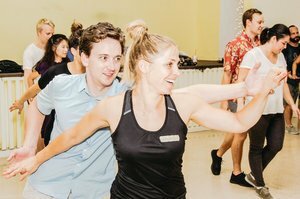 Teaching Jitterbug and Lindy Hop since 1994, our eight-week beginner and intermediate classes have set the gold standard in swing dance instruction. You never need a partner; we rotate partners in our classes so everyone has a chance to learn and practice. Classes are open to dancers of all ages, no partner required (we rotate partners in class). In addition to our regular classes, we also offer specialty classes: aerials, team performance, Balboa, and advanced styling, to name but a few.